The Faculty Lounge: What Do Second Passport Applications Suggest About Israel's Future? What Do Second Passport Applications Suggest About Israel's Future? I was surprised to discover that, according to a recent survey, 59% of Israelis have either sought, or intend to seek, a passport from a second nation. Many Israelis are apparently eligible for EU papers because their families came from EU member countries before the Holocaust. Why the widespread interest in these passports? There are a couple of reasons that come to mind. One is that the EU passport makes for easier international travel which is tremendously helpful in an era of globalization. It also offers greater employment flexibility; Israel is a small country and workers will find many more job openings if they can include the entire EU in their searches. Then there is the stigma of the Israeli passport: EU papers may open up business opportunities in Arab states. But it also strikes me that this second passport is a good hedge against the risk that Israel will lose its identity as a Jewish state. The longer it takes to reach a two-state agreement, the less likely that Palestinians will support such a solution. Many Palestinians already realize that a single Israeli state would soon become minority Jewish and they're willing to bet that, given both Israeli commitments to democracy and international pressures against minority rule, Israel's future may be as an Arab state. Perhaps Israelis share this pessimistic view more than I've supposed; that is one explanation, at least, of the dual passport phenomenon. Wrong, Dan. It's a sign that the Israeli public doesn't trust it's government to keep it safe, and if it becomes necessary to flee, they have somewhere to go. The two-passport phenomenon gained its momentum during the second Intifada, as people wondered whether they could raise their families in a country where it wasn't safe to go to a cafe or on a bus. And insofar as the Israelis are responsible for the preciptating event (Sharon's deliberately provocative appearance outside the al-Aqsa mosque surrounded by riot police) and the socio-economic and political conditions that prompted the second Intifida, their fear is a direct and predictable consequence of their own actions and policies. In any case, if the Israelis don't trust their government, they're perfectly free to form a new one. My comment was a statement of fact, not a political opinion, and not an invitation to you to express your fantastical view of history. 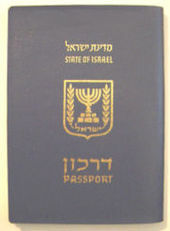 I can offer only anecdotal evidence, but the Israelis I know have a variety of reasons for obtaining second passports. Some are related to economic and educational opportunities, others are related to safety concerns. One of my friends obtained second passports for himself, his wife and each of his three children, in five different countries, as sort of insurance policies, explaining: "if things go bad here, at least one of those nations will take us in." The second passports were, I think, U.S., Canada, England, France, and Germany. The German one surprised me a little, but in a good way. I certainly don't need an invitation from you to express my views here on anything whatsoever and, in any case, the views I've expressed are well documented and culled from the many books in my library regarding the Israeli/Palestinian conflict which I've been reading since my days in graduate school in the early 1980s. So the view of I have of this particular history is neither peculiar to me nor fantastical. Now that I have another moment to more fully respond to your rather patronizing comment, you would do well to consider the possibility that what you pronounce as a "fact" may be arguable or at least not unambiguously such, as Ann Bartow's anecdotal evidence, for example, suggests. Now as to "fanatastical history," your remark makes me think that you either don't understand the meaning of that phrase, or are employing it in an ideologically tendentious manner, perhaps by way of a not so subtle insinuation of your political opinions. In the context of the Israeli/Palestinian conflict, Palestinian scholars and the Israeli New Historians and Sociologists, among others (e.g., the journalist Sylvain Cypel), provide us with a virtual embarrassment of riches when it comes to examples of "fantastical history," so that if one wants to learn of exemplars of this genre, as well as the historical research that is committed to the idea and ideal of historical truth, and thus is dedicated to countering the lies, illusions, and denial that is part and parcel of fantastical history, then one should carefully read the works of, say, Ilan Pappé, Baruch Kimmerling, Noam Chomsky, Samih Farsoun and C.E. Zacharia, Edward Said, Uri Davis, Nur Masalha, Uri Ram, Rashid Khalidi, Walid Khalidi, Gershon Shafir, Benny Morris, Naseer H. Aruri, Joel Beinin, Saree Makdisi, Richard Falk, Jonathan Cook, Charles D. Smith, Norman Finkelstein, Sami Hadawi, Ian Lustik, Maxime Rodinson, Eugen Rogan and Avi Shlaim, and As’ad Ghanem. From this representative list of writers with a demonstrated facility for puncturing the myths and delusions of fantastical history we discover, for instance and in the words of Cypel: that "[w]ith regard to the actual events occurring during the war of independence of the Jewish state in 1948, more and more Israeli historians have been corroborating what Palestinian historical studies have been claiming for a long time;" that "[t]he occupation is the terrain on which terrorism prospers, borne along by desire for liberation. A large majority of Israelis are still unable to understand this, even if they are becoming more aware of it in a confused way. For most of them terrorism, especially since it appears overwhelmingly suicidal, can only be a phenomenon disconnected from reality and rooted in the insanity of the Palestinians' hatred for Israel and the Jews, or in Islam itself, or in both;" that "the Zionist movement said it bought the land of Israel in due form--which for 87 percent of the land, was a lie;" that [t]the problem is that the overwhelming majority of Israelis do not feel like foreigners in these occupied territories, which, as they have been taught since kindergarten, form part of Eretz Yisrael, 'their' biblical land. The Palestinians, for their part, do not consider Israel a foreign place, most of their parents or grandparents were forced to leave it, and their family memory is marked by that exile;" that "[b]eyond its colonial aspects (understood in the strict sense: the emigration of a population coming from elsewhere and the conquest of the land) as they were espoused at the time, Zionism, like other national movements...was characterized from the outset by a profound ethnicism. It is steeped in the cult of 'roots,' of the relationship to the land, the privileging of cultural specificity, the equation of nation and religion, and national emancipation via separation from others, if necessary by their expulsion;" that "[d]espite the ravages of ethnicism in the twentieth century, and despite the evolution of modern societies in which hybridity is increasingly becoming the norm (a phenomenon that creates multiple new problems and is uniformly rejected by nationalist, populist, and extreme right-wing religious movements), Israeli society in its entirety has remained deeply imbued with an ethnocentrism that has become more intense during the occupation of the Palestinian territories;" that "there were more massacres of Palestinian civilians than the popular official version of history has let on since the 1950s. That version systematically limits itself to the single case of Deir Yassin on April 9, 1948, and perceives that massacre as insignificant because it was committed by militants of Etzel and Lehi, two ultranationalist paramilitary organizations supposedly uncontrolled by *yishuv* leadership. [....] What identifies this war [of 1948] and the indelible impression it left on the peoples of the region is the interconnection of the crushing Israeli victory and the likewise massive expulsion of the Palestinian population. it is also the fact that this interconnection was long denied in Israel and still remains largely concealed;" indeed, that "[f]or the vast majority of Israelis, 90 percent of whom did not experience them and have been presented with a fictive version of them, the events of 1948 are known, vaguely apprehended, or, most often wholly unknown;" finally, that "no serious historian nowadays can deny [the] evidence: for the Palestinians, 1948 was what we would now, after the recent war in the Balkans, call a vast ethnic cleansing." Erratum: "...that are part and parcel of fantastical history..."
First, I apologize for other typos above. Second, if anyone should like to read a nice, succinct, and by my lights persuasive treatment of the *yordim* (i.e., those Jews who are leaving Israel, in contrast to the Jews returning from a 'diasporic' condition to Israel or the *aliyah*), which of course has some bearing on the questions raised in Dan's post as well as relevance to an unbiased assessment of Mr. Bernstein's claim to be making a statement of "fact," please read the section, "The 'Soft Underbelly' and the Temptation to Leave' in Sylvain Cypel's remarkable book, Walled: Israeli Society at an Impasse (New York: Other Press, 2006), pp. 404-410. Cypel reminds uf of the "corruption, the failure of the rule of law, and societal violence" that are "recurrent themes in the Israeli media. In addition, "The number of people seeking a thousand ways to escape the draft is increasing rapidly, a new phenomenon in a country in which military service has always been both a duty and a certificate of entry into active life." Cypel estimates that "Half of the draft evaders have social motives, the others ideological ones." In addition to draft evasion, desertion has become a problem, the "rate of desertion" has, from a rate of 7 percent in 1999, "according to military police," reached "67 percent in 2002" (see The Guardian, Nov. 19, 2002). Cypel's discussion suggests the reasons (mostly young) people are leaving Israel are varied, the conflict with the Palestinians one but by no means the only reason, and, in any case, no where does it appear that even that reason can be simply reduced to "people wondere[ing] whether they could raise their families in a country where it wasn't safe to go to a cafe or on a bus." Interestingly, Cypel also informs us that "Israel had already experienced two major phases of departure, in 1954-56 and 1964-1966, due to economic recessions," and that today, economic motivations are not uncommon among those seeking to get dual nationality. Cypel himself concludes that "the race for European passports reveals an inexpressible lack of confidence in the future of the state such as it is." Re: (a)--Ann's comments are only "utterly consistent" with yours insofar as "safety" (or risk estimates and heuristics) and "fear" (which cause distrust of government) can be counted among reasons that exist within a larger class of varied reasons of the sort she provides, otherwise, there is nothing whatsoever consistent about the *reason* you provide for obtaining second passports and hers, as she provides several, different reasons, you provide, essentially, one, namely what she terms "safety concerns." In short, one motivation to the exclusion of others, and labeled as a "fact" simplicter as opposed to finding several and different (perchance mixed) motivations at play, a scenario more plausible if not likely given Cypel's discussion above. I am very interesting in obtain immigration or a passport, I am a Palestinian refugee holding a Lebanese Travel Document, not a passport. The travel document does not have the same privileges like any other passports. It limits and restricts my travel regardless if the travel is business related or not. The document also limits my career progress as many companies do not accept the travel document. Sir all I want it to obtain immigration or a passport, Please help and advise me. A good name is easier lost than won.